I totally forgot that Monday was coming and to sign up for the Ippity blog hop. But I did make an Ippity card yesterday so I thought I should post it. I'm actually really quite happy with it. I made this card with the Ippity Just Wanted to Say set and a DCWV Latte mat stack. I used a bunch of circle punches. And don't forget, I am still running the fundraiser for Tyler. $5 of each set purchased will go to his medical fund and they really can use the money. :) Thanks for reading this! 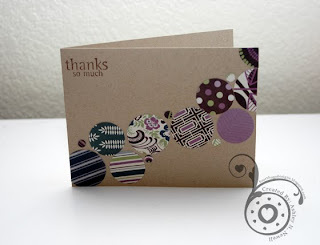 That purple and black on kraft is a great color combo....and those punched circles are really fun! Way cool... I made some circle cards like this not too long ago... lots of fun!! LOVE that purple on kraft-one of my fave combos! What a happy cute card! Way cute! I love this idea... I think I might have do that!